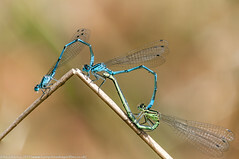 Large damselflies with metallic green or blue bodies and dark wings. 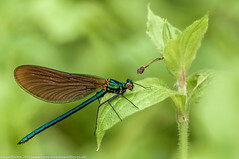 Banded Demoiselle A large (45mm) damselfly preferring slow-flowing lowland streams and rivers. Numbers can be very high at prime locations. .
Beautiful Demoiselle The other species of large (45mm) damselfly in Britain to have obviously coloured wings. Preferring sandy bottomed streams and rivers. 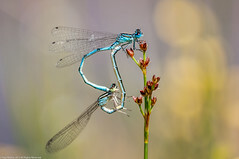 Small to medium-sized damselflies often seen in large numbers were present. Small Red Damselfly One of our smallest (31mm) damselflies preferring shallow pools, seepages and streams in heathland bog. 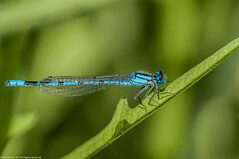 Southern Damselfly One of our rarer damselflies, preferring base-rich runnels and streams often within acid heathland and chalk stream water meadows. Azure Damselfly One of the larger (33mm) blue damselflies. 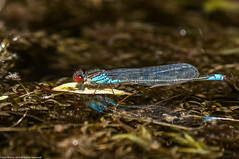 Seen in most habitats including ponds, streams and larger water bodies where they are often found in swarms. 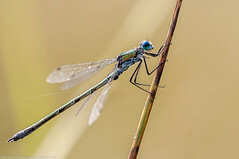 Variable Damselfly The Variable Damselfly is a reasonable large (33mm) damselfly superficially similar to the Azure and both species may be found in the same habitat. 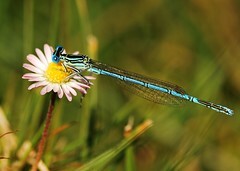 Common Blue Britains most widespread damselfly. Found in most water bodies and surrounding heaths, meadows and woodland. 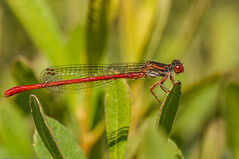 Red-eyed A robust and conspicuous damselfly, found in lakes, gravel pits, canals and slow-flowing rivers often perched on water lillies and other surface vegetation. Small Red-eyed Considerably smaller (29mm) than the larger Red-eyed and not as widespread. 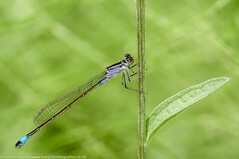 Blue-tailed A common and attractive damselfly found in a wide range of lowland habitats including brackish or polluted water. Scarce Blue-tailed Considerably smaller (29mm) than the larger Blue-tailed and not as widespread. Can reach large numbers where found. Preferring warm, shallow pools with emergent vegetation. 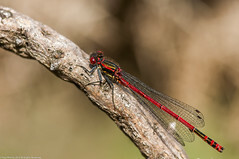 Large Red A large (36mm) and active red damselfly with black legs and a bronze-black top to the thorax which has broad red or yellow stripes. Southern Emerald A slim, metallic green emerald which turns bronze as it matures. Broad, pale ante-humeral stripes on the thorax and pale behind the head. The pterostigma is bi-coloured. Males become pruinescent only on abdominal segment S10. 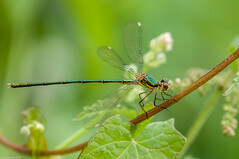 Scarce Emerald A medium sized emerald damselfly which usually rests with its wings half open. 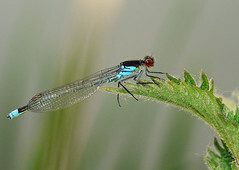 Adult males have blue eyes and powder blue pruinescence on the thorax between the wings and on S2 and S8. 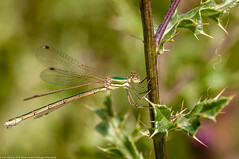 Common Emerald A large (38mm) and attractive metallic green damselfly which unusually perches with its wings half-open. Willow Emerald Larger and bulkier than the Common Emerald. 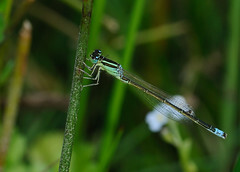 Metallic green with no blue pruinescence on the male.The pterostigma is pale brown with a black border. The male upper appendages are distinctively pale (like the sides of the thorax) with dark tips. 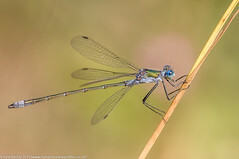 White-legged Damselfly A medium-sized (37mm) damselfly with white legs and a narrow head. Preferred habitats are slow-flowing rivers and streams with an abundance of bank-side foliage.